Since we're visiting southern California and feeling at home in the pouring rain, what better time to see old friends from our San Francisco days who live locally. We'd reconnected with Paul and Barrie last year at this time here at our family beach condo, along with other friends who we missed this time around. This time we traveled south to their lovely old Spanish-style home for dinner and tastes of a few really good and interesting wines. I'll spare you the details of the older kids playing video games and the occasional chase around the house with the younger twins who have endless energy. Though it was really fun and Paul and Barrie's kids are impossibly cute. Instead, the wines, first the 1992 Zind Humbrecht Tokay Pinot Gris Clos Saint Urbain Rangen de Thann. I don't know my Alsatian grand crus nearly well enough, but I know this is a top vineyard with a long history worth knowing about. So how was the wine? This isn't Oregon Pinot gris, to say the least. Eighteen years old, opulent and ripe, lightly sweet but nicely balanced, rich with stone fruit juiciness and an expected mineral quality, all still youthful and clearly capable of aging for another decade with ease. This was exceptional. Then a bagged wine, a red wine I guess to be some no sulfur gamay from Beaujolais or maybe the Loire. Some spritz at first, pungent strawberry and ashy earth aromas. Bright and a bit lean in the mouth, there's great energy in this wine and a long, slightly cheesy finish. Clearly no sulfur but I had no idea it was from Sicily. 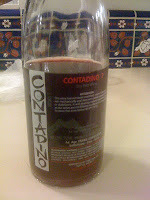 It was the Frank Cornelissen Contadino 7 Rosso Etna, from the slopes of Mt. Etna made in amphorae with the Nerello Mascalese grape. 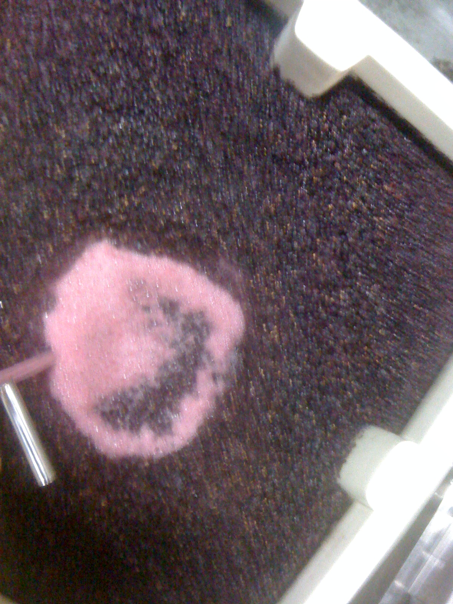 This is totally natural wine, something many winemakers would taste and remark, "you know, some sulfur would clean that right up." But that's not the point. And strange as the wine is, I found it grew on me, especially tasting a bit with pizza dinner. Probably more of an intellectual pleasure than purely delicious, but I still really appreciate wine like this. But I'm a wine geek. Paul also opened the 2009 Domaine Dubeuble Pere et Fils Beaujolais, imported by KERMIT LYNCH in case the label's too subtle. This is really good, more straightforward wine compared to the Cornelissen. Just another example of how great 2009 is in the greater Beaujolais area. 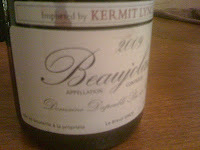 Purple, bright fruit and gravel and soil notes, great texture, simply delicious gamay. But the coup de grâce was the 1942 Jean Bourdy Cotes du Jura, a World War II era bottle from the remote Jura region near Switzerland. This bottling is a blend of Plousard, Trousseau and Pinot noir, aged three to four years according to the back label (en Francaise) in old oak tonneaus. 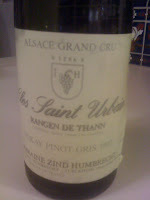 The wine was probably better some time ago, but still was a delight for its history and flavor. Almost honey gold in color, the aroma was meaty with some pungent notes from oxidation. The flavors were seamless, with a nutty middle and finish like a dry sherry, certainly from oxidation in the winemaking and elevage process and also from 60+ years in bottle. Again, an intellectual pleasure more than anything, though also memorable purely for its taste. Thanks Paul and Barrie for such delightful wine and for opening your house to us. We'll have to repay you in Portland. It's shameless but I'm not above that. 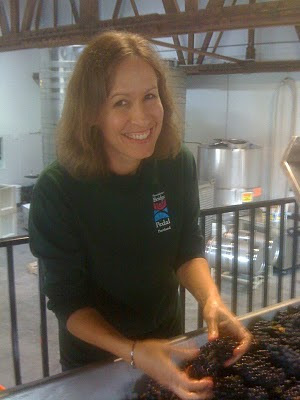 Check out this article in this week's Portland Tribune on urban wine making in Portland, Oregon. Some colleagues and I are featured, and if you're local, the print edition has some really good pictures. Only one seems to have made it online. Ok, end of shamelessness. This weekend saw the final act of my nocino (no-CHEE-no) making that began last summer -- bottling and my version of labeling. In July, I picked green walnuts, chopped and soaked them in a variety of liquors and sugar and spices. 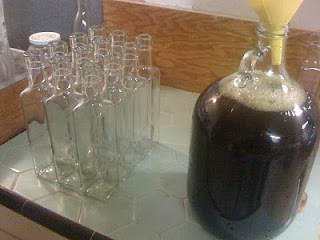 Two partially full gallon jugs worth sat for months to steep and oxidize and otherwise maderize. 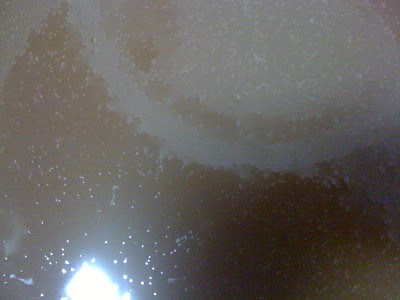 Last month I poured the now chartruse brown liquid off the walnuts and sediment to settle some more and continue aging. Now it's December and time to finish things off. 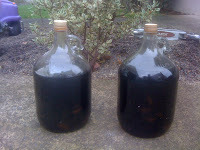 This was my first attempt to make nocino and I thought I would make two jugs worth instead of just one, to have plenty. But after all this time, I figured I'd get only a little more than 4L of liquid. So I found square 250mL bottles and some t-top corks, which would give me between 16 and maybe 18 bottles. That's not too many if you plan to give a bunch away as gifts and keep several for aging, drinking, cooking (nocino whipped cream, anyone?). This stuff is good. So next year I'll have to make even more. 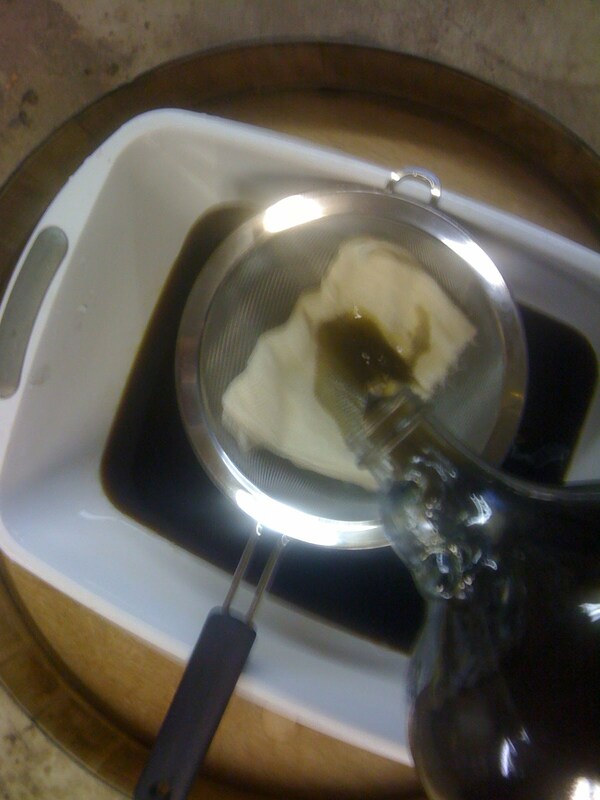 I began by straining the nocino once more through folded cheese cloth, into a tub big enough to combine both jugs. One jug had more sugar, the other less, but a blend turned out to be best. Then I poured the blend carefully back into a jug to make filling each bottle easier, with the little yellow funnel to keep things tidy. The only real challenge was dealing with foam that came from pouring the liquid, as you can see in the jug. I filled each bottle, waited for the foam to subside, then topped up and put a t-top cork into each one All together, I had 18 bottles. I rinsed off each bottle and let them sit overnight, before heating up yellow sealing wax in a stove top pot to dip the bottle necks. 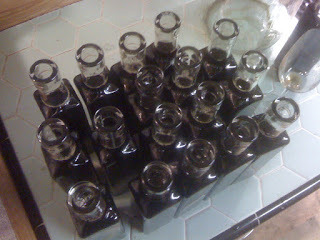 It was tough to get the wax just the right temperature to adhere well to the plastic tops of the t-corks. Finally I got things right, waxing each bottle and dipping the waxed top into cold water to set quickly and give a little shine. Then a final wipe down and silver Sharpie to sign each bottle in a way that ended up echoing old port and madeira bottles with their white stencil paint. 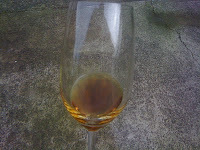 So how does this nocino taste? Think liquid gingerbread with a kick. It's fairly sweet but appropriate to balance the pleasant bitterness of the walnut tannin. 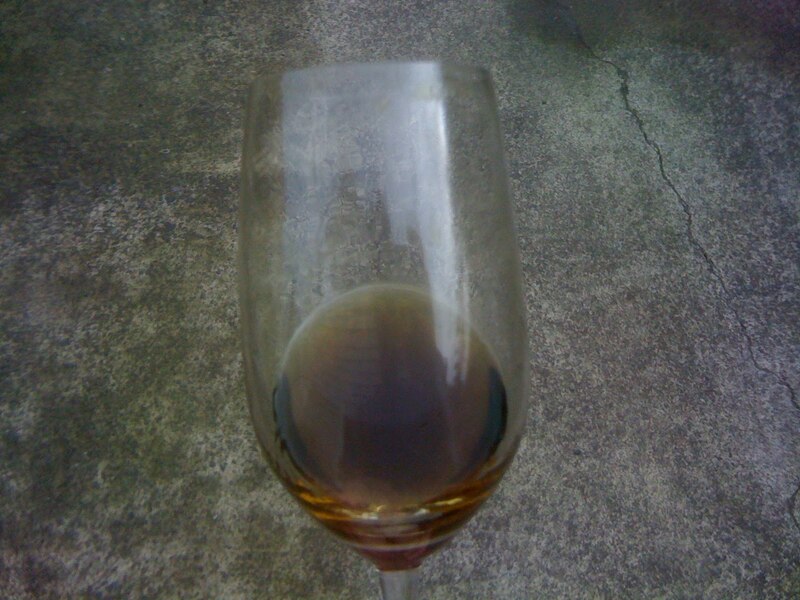 What experience I have tasting others' nocino, age should smooth out any rough edges, though this nocino isn't excessively tannic or bitter as I might have feared, being a newbie. In all, I'm very pleased and there are some lucky people out there who will get a bottle. 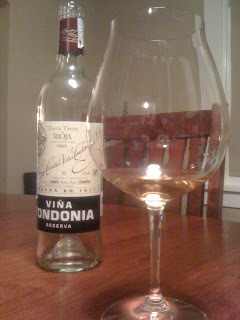 I got home tonight and was compelled to tweet how love is coming home to 1990 Lopez de Heredia Vina Tondonia Rioja Blanco Reserva. Our neighbor Jamey had mentioned recently on a walk back from the kids' bus stop how he loves this very old school Spanish producer from Rioja, one of my favorites. Tonight he came by with a nice glass pour from the end of the bottle while hosting a Hanukkah dinner. I wasn't home yet but Jennifer graciously accepted such a gift, though Jamey apparently said "you should just drink it all." Not bad advice. Jamey's no fool. Jennifer of course saved me half and, upon my return from a long day at work and some play, I put my nose in the glass. How can 20 year old white wine be so fresh? Yes, the wine is aged in oak for several years and intentionally oxidized in the process, softened and opened by time. Then bottled and held for years. Now, the cork finally out and wine in the glass for drinking, there is an aroma of spiced lemons, wax and a soft, pleasant herbal character from the American oak aging. And a freshness that belies twenty years since the grapes came off the vine. In the mouth, there's richness and acidity, a brightness immediately that amplifies to a full flavor of lemon cream, spicy wood and jelly candies, then acidity to tighten the flavors and carry them nice and long. There's an impressive dynamic to this wine. It's clearly not simple wine, yet it's not complicated or difficult to enjoy. Perhaps that's a trait of the greatest wines, and while this is not what I'd call "great," it is very, very good and special. Thanks Jamey, and thanks love for saving me some. Of the leftovers from Thanksgiving, one wine remains. The last wine, the port. On yet another cold rainy Portland night, it seems fitting to finish it off at last. And reflect on wine of such quality and a small personal story. 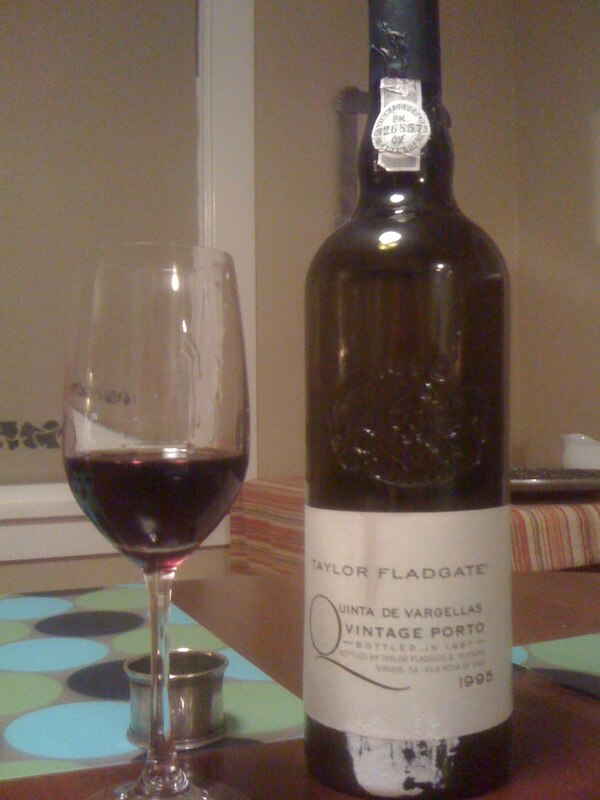 I remember finding a little cache of 1995 Taylor Fladgate Quinta de Vargellas Vintage Port several years ago for a remarkably low price (a common story it seems in my cellar). I asked the manager about the price and he said that's what the distributor sent, and maybe it wasn't the right wine (should have been the Late Bottled Vintage, I'm sure), but that's the price, go for it. So I bought six. Douro Port houses declare "vintage" ports every few years, when the quality is exceptional so that excellent young wines are bottled after two years, sold at a premium and intended to age for decades in the glass. These are the wines collectors prize most. The '77s and '70s, '63s and '45s, among other classic years. Most years produce more basic ruby wines that are bottled early for their grapiness and tawny wines aged longer in cask to develop more nutty qualities. You'll see these commonly for low prices in grocery stores and wine shops, and they provide nice port drinking (and cooking) quality without the depth or price of the more serious wines. However, there are some particularly good years that may be declared vintages by many houses that for one reason or another aren't declared by others. Typically that happens in years such as 1994 and 1995. '94 was exceptional, and many houses quickly declared the vintage to produce their top wine. However, '95 was also excellent and, had they not declared '94, perhaps '95 would have been the "vintage" year of for a given house. For many, it was declared. 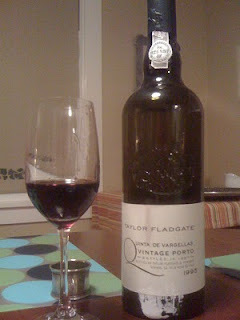 For others like Taylor's, you see what I'll call a junior vintage Port, the single quinta (or vineyard) bottling. We won't fall into the trap and call this wine as good as regular vintage quality. Sometimes wine marketers will make such claims, about single quinta Ports or, for example, Cotes du Rhone from a vineyard "just outside" one fancy appellation or another. This isn't vintage port, plain and simple. But it's darn close and considering the track record of Quinta de Vargellas wines going back to the '50s and earlier, clearly there's longevity and real potential here for development in the cellar. So how's the wine? Well, young as I would expect, even at 15 years of age. Deep ruby color, with a classic peppery, spirity, mixed berry, fresh tobacco and raisin aroma. The flavor is moderately sweet with excellent richness and fresh acidity, softening tannin and peppery, tobacco flavors to add savory qualities to the plum and berry fruit. 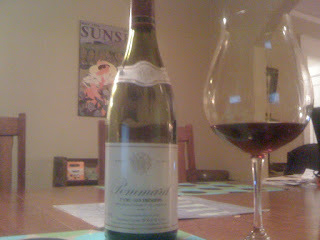 The finish is long, slightly warm and simply gorgeous, even after the bottle has been open for nearly a week. There are many dessert wines in the world, but vintage port is one of the most classic and delicious. This wine shows why. Love it. And a story. I found this wine is early 2002 and brought a bottle to a tasting event where my friend, Roy Hersh of For the Love of Port out of Seattle, brought a bottle of 1935 Sandeman Vintage Port. 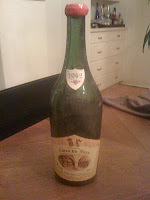 My young single quinta wine paled in comparison to Roy's special bottle commemorating the coronation of King George VI. But Roy is so gracious. We had a nice conversation about Vargellas, its history producing terrific ageworthy wine. My '95 showed well but young, and time is still a friend here. I'm happy to have more. If you're wondering, that '35 Sandeman was pale ruby and spectacular, everything you could want in old Port. I can still taste it. The night was particularly memorable. I'd found out that morning that my wife was newly pregnant with our now 8-year-old son Martin, something I couldn't share with anyone because of the fragile uncertainty of things. We were leaving for Australia in the morning to visit family, obviously it had been a big day, and now here were wines by which a guy like me will remember everything. That legend from 1935 and one of several bottles from 1995 that I would open over many years, commemorating that time of life. This Thanksgiving marked the first time since then I'd checked in on the '95 Taylor. I'm happy to have the opportunity to check in again and again. 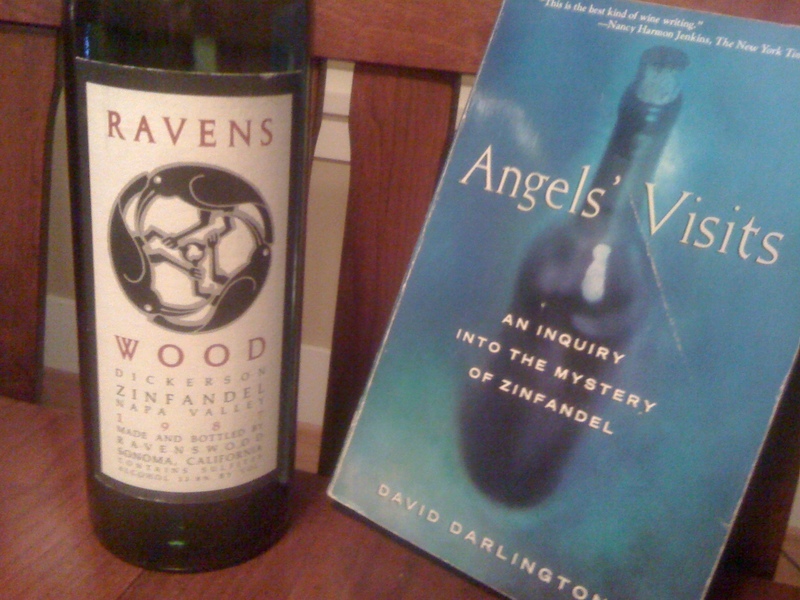 I'm not alone in owing my allegiance to zinfandel to things like old Ravenswood zin and David Darlington's book Angels' Visits. These days you might know Ravenswood as a ubiquitous brand on grocery store shelves across the U.S. Back in the day, Ravenswood was a small Somona producer of serious zinfandel, wine at the time considered "big" but downright subtle by today's alcohol and ripeness standards. I can relate to founder Joel Peterson, starting a winery with a day job and a passion or obsession with a certain vision for wine. Nearly 20 years ago when I got into wine, I first read Angels' Visits, what was a new book at the time. Subtitled An Inquiry into the Mystery of Zinfandel, it was just that -- a journalist's inquiry into the story and appreciation of California zin. If you like wine and wine books, you might have found like I have that you can read a good book about wine, even wine you don't know about or care about, and both LOVE the book and find yourself compelled to seek out the wines mentioned therein. Good travel writing is similar. You read something and find yourself compelled to travel somewhere you would never have guessed. Happily, with wine that travel can be a lot simpler. Angels' Visits is one of those books, and something that many wine lovers I know will easily suggest if asked about good wine books for a summer trip or just lounging around the house, preferably with a glass in hand. It's set in the late '80s, chronicling the '88 harvest at Ravenswood with lots of juxtaposition with Ridge winery down in the Santa Cruz mountains, another zinfandel legend. There's also a great recounting of zin's mysterious history in California, somewhat out of date given more recent genetic study of zinfandel's origins but still worth knowing for the CA history and what zinfandel meant twenty and more years ago. There are visits to specific vineyards, like Old Hill and Dickerson, and California wine legends like Darryl Corti of Corti Brothers in Sacramento. There's dinner at Chez Panisse, reason enough to read anything in my mind. And there's homebrewed zin. The author Darlington contributed to my winemaking inspriation by making his own home zin with Ravenswood-sourced grapes as a narrative foil to the zins he observed in production all over northern California during the time he wrote the book. 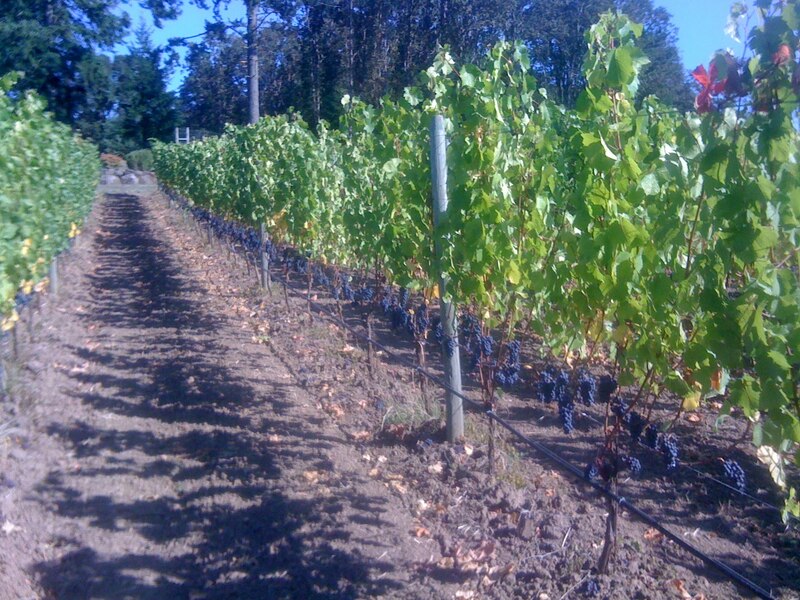 One of the several threads in the book is the critical reception of the 1987 Ravenswood Zinfandel Dickerson Vineyard. Dickerson is one of the top sites for zin in California, interesting for being in Napa (cabernet country) where most top flight zinfandel comes from Ravenswood's home, Sonoma. Dickerson is known for producing wines with intense minty eucalyptus character, like the old Martha's vineyard in Napa, similarly surrounded by oily eucalyptus trees. Without being a spoiler, near the end of Angels' Visits we learn that Robert Parker of The Wine Advocate has awarded the '87 Ravenswood Dickerson 93 points, then an extremely high score (things have changed in that arena). The implication is that the Dickerson reputation is reaffirmed. Fast forward to last year when I found a bottle of 1987 Ravenswood Dickerson Zinfandel at auction for a pittance. Why not buy and see if a premise in the book, supported by Parker's reviews at the time, was true - zinfandel could age and Ravenswood Dickerson zin especially could age, perhaps turning Bordeaux-like. So with Thanksgiving dinner, the American holiday, a quintessential American wine opened alongside a cabernet-based Bordeaux, the 1994 Cos d'Estournel St. Estephe. The Cos was prototypical Medoc wine, gravelly cassis and bell peppery cabernet with resolving tannin, a good amount of French oak, but nice length and savor. I was really impressed with this wine, which is still young but drinking well. By contrast the 1987 Ravenswood Dickerson was evolved, still together and to my taste delicious but clearly on the far end of the evolutionary spectrum. Not tannic as the Wine Spectator apparently complained on release. Lots of eucalyptus notes that people seem to either love or hate (the former for me in this case). 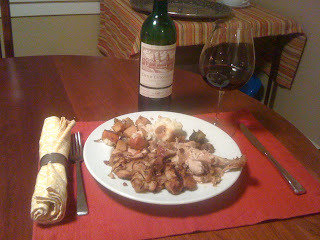 And sweet/savory dried red fruit flavors that went well with the earthy flavors of Thanksgiving dinner. Before you dismiss the zinfandel as an overdone new world mess unfit for any dinner table, note the 13.8% alcohol on the label, back when that was high, justifying Ravenswood's now tired slogan "no wimpy wines." Whatever happened to 13% range zinfandel that can age and match with food, even decades into its life? There are a few still out there, but if you're like me, you're also trolling the auctions to find these lately unwanted gems. And thinking about pulling out Angels' Visits for yet another read. Like some wine, great books can get better with time. After a long week+ of all kinds of things in life, I came home last night and simply wanted a really nice bottle of wine. Something to enjoy, to ponder, that would keep me interested all night. Where else to go but Burgundy. So the 2000 Lucien Boillot Pommard Les Fremiers 1er Cru. 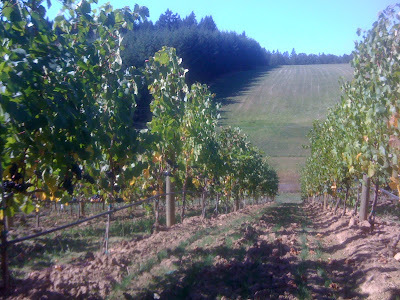 Oregon wine fans hear a lot about the Pommard clone of Pinot noir. Cuttings from the Chateau du Pommard in this Cote d'Or village were the source for lots of plant material in California and Oregon, especially the latter. 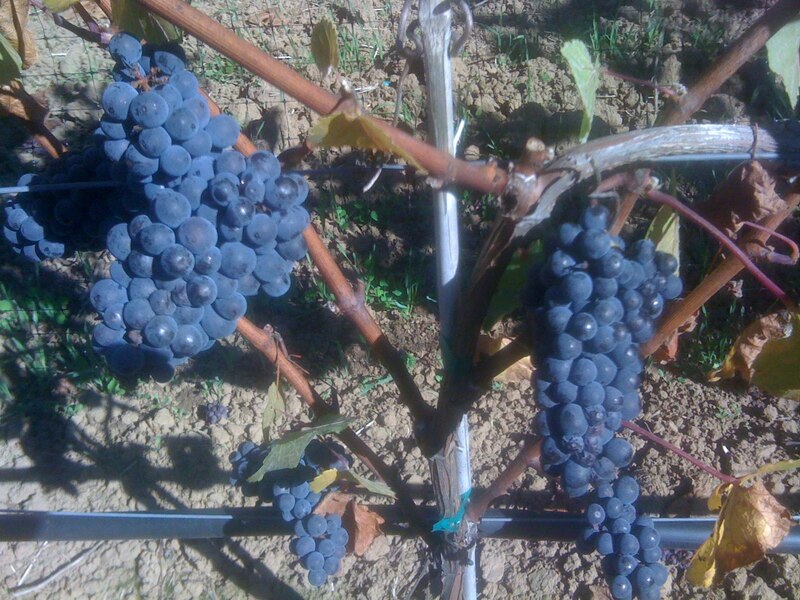 That doesn't mean our Pommard clone wines taste like wine from the village Pommard. We do prize the earthy quality of Pinot noir wines made from part or all Pommard clone here in Oregon. Tasting the real thing from a top producer, from a premier cru vineyard in the village, it's clear there are echoes what we believe to be true about the Pommard clone. But so much more, including what I can only describe as a real taste of the earth. People debate to no end whether or not mineral flavors (if minerals even have flavor) are present in wine. I can only point to much good Champagne and the taste and texture of chalk. Then to good Cote d'Or Pinot noir like this, with a firm mineral quality that's not acidity or fruit or tannin or barrel flavors. Nor in any other Pinot noir I've tasted outside Burgundy. So what was this bottle like? At first a little mature, but in a way that suggested it would recapture some youthful freshness as the wine was exposed to air. Don't ask me the science. I just know the experience. The color was young and the elements seemed less mature than the package. Sure enough, the aroma developed a mix of black cherry, sous bois or wet earth, and a distinct cured sweetness that really good aged wine, like aged meat, gets. There was clearly a lot going on with this wine aromatically. On the palate, there was bright acidity and fine tannin, medium bodied flavors without quite the breadth of the aroma but nice length, lingering with a mineral savor that makes food more interesting as well as the next sip of wine. Essentially, just what you want from a nice bottle of wine. At least, what I consider nice. This week, I spent a nice afternoon in the Eola Hills with my friend John Grochau, visiting Mark Bjornson of the Bjornson vineyard and Erin Nuccio, the new owner of Evesham Wood. We were checking with Mark about grapes for the future and took the opportunity to check out Erin in his new digs. I'm happy to announce that, starting with the next harvest, Vincent Wine Company will source grapes from Bjornson. I can't wait. John has already produced two promising vintages of wine from Bjornson, and Erin started sourcing there in 2010 and will continue. Not bad company for me to be in, I think. We first ran a few errands in Dundee and McMinnville, making our way down a wet and windy 99W and crossing the Eola Hills on Zena Road. 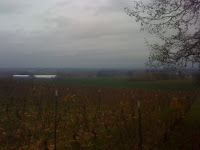 Passed the Zenith vineyard, another Vincent Wine Company site, the vines a mix of yellow leaves and bare branches like all vineyards in the area this time of year. Around and up the hill, we arrived at Bjornson vineyard. Mark and wife Pattie Bjornson are Minnesotans who first planted this site in 2006. 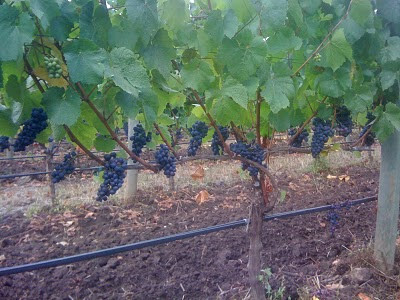 The initial Pinot noir vines came into production with the 2009 vintage, with more blocks like the one pictured coming on line in 2012. 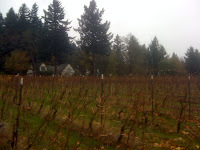 The site is just south from the famed Seven Springs vineyard, which is visible from the Bjornson's kitchen through the trees and across the ravine. Not a bad neighborhood. 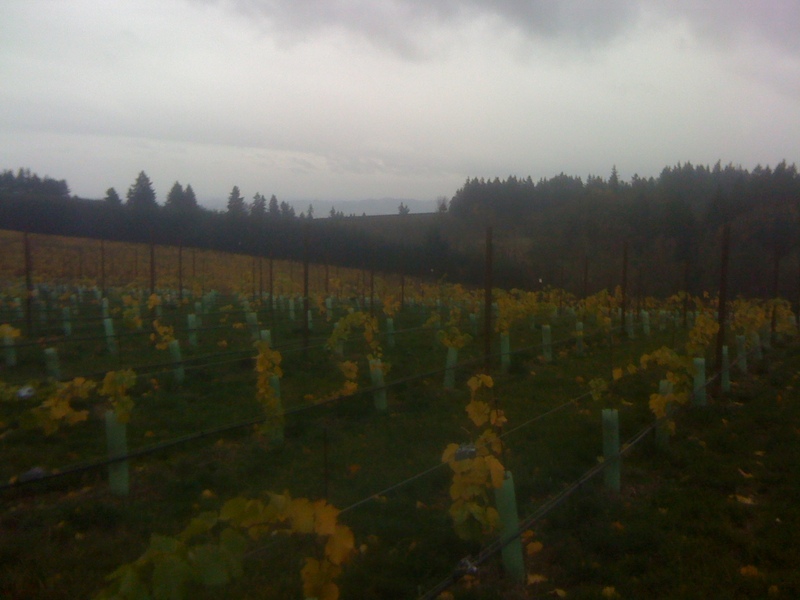 Bjornson vineyard looks ideal. It has a mix of south, southwest and east exposures, with volcanic Nekia and Jory soils. The pictured block looks due south to Salem and is particularly rocky. Elevation is in the 500' range. The site is LIVE certified and there's even a wind turbine just out of view that provides electricity for vineyard operations. But how does that translate into wine? Based on what I've tasted from barrels at Grochau Cellars, this site produces powerful wines that retain great elegance. Not unlike Seven Springs. This is a different site, but the resemblance is promising. We tried a few things at Mark's, including brand new Gamay noir made in their barn as well as official 2009 Bjornson Pinot Noir, made by Aaron Hess of Daedalus. The gamay is fresh and should be good home wine. I hope to get some Bjornson gamay grapes in the future. The '09 Bjornson shows nice restraint for the hot vintage, though Mark thinks it's just a bit closed still. Then down to Evesham Wood close to Salem. Erin was delayed so we walked the estate Les Puits Sec vineyard, here in an old white block looking up to the Tudor style house, with winery in the basement. Very old world feel here. Looking the other way, we would see a great view of Mt. 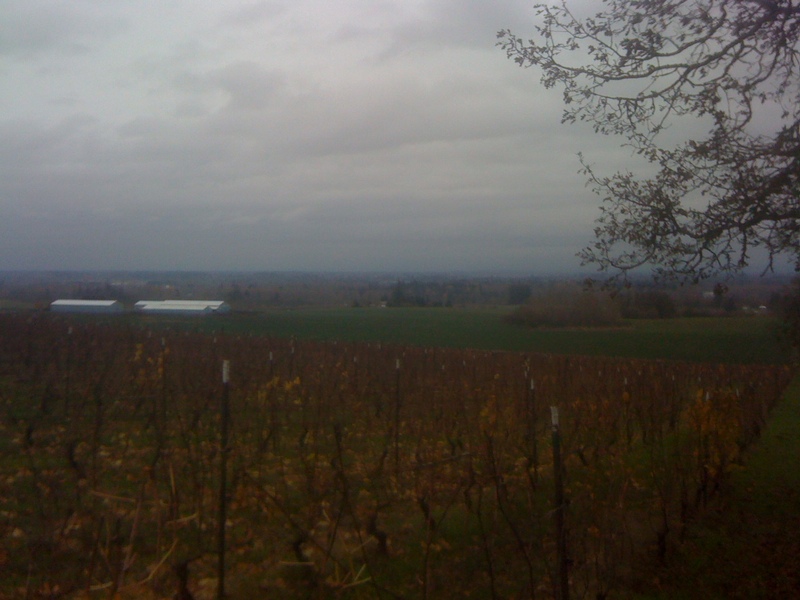 Hood and the Willamette Valley, though the elevation here is lower, only in the 300' to 400' range. The wines from this vineyard prove that elevation isn't everything. Before Erin arrives, we hang out on the crush pad checking out what's changed from five years ago when I worked the '05 harvest here. Yes, a shot of a younger and thinner me working with Russ. Pushing a drained fermenter into place by the old press, getting ready to empty it out the old fashioned way - with buckets. 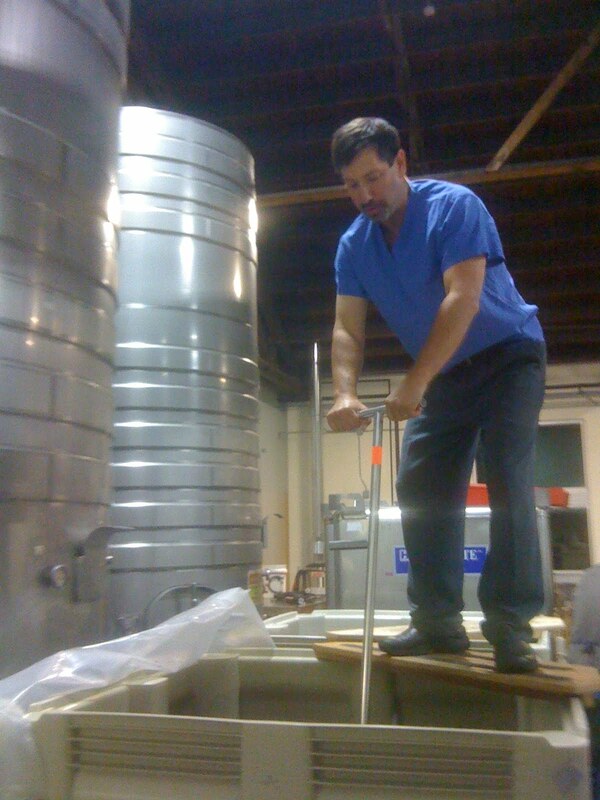 Even then, cellarmaster Miguel and brother Isaro were talking about a bin dumper. Waiting for Erin, we catch up a bit and the topic of the bin dumper surfaces. It's apparently going to happen. When Erin arrives, we head into the cellar, seeing Miguel moving a stack of barrels with the funky old stand up forklift that reminds me of the droid/monster Box from the '70s era sci-fi classic Logan's Run. Maybe you had to be an impressionable kid with questionable taste to get see that one. 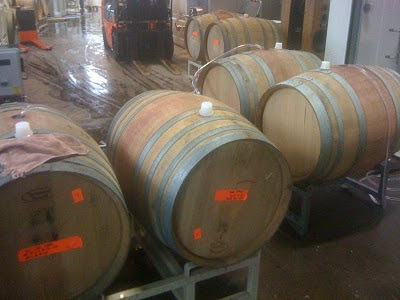 So we walk back into the barrel cave and start sampling various '09s still resting before bottling in winter or spring. A cask of Les Puit Sec is typically broader and full but with, again, nice restraint for the hot vintage. The lower elevation here mean this site comes in early, a boon in cool years, sometimes tougher in hot years but not this time. Very nice. Then Temperance Hill, '800 above Zenith and Bethel Heights, very ashy Pommard clone character with taut cherry and cranberry flavors. Love the finesse here. A sample of Eola Springs, from the western side of the Eola Hills, shows typical light and bright flavors. Good nerve here. The Illahe we tried will go in a single vineyard bottling, though most barrels still make up the base of the Willamette Valley cuvee already bottled and released. This sample is floral and perfumed, without too much weight. Then a final taste, from the Bryn Mawr vineyard across the road from Bethel Heights. Not unlike Temperance, which is just up the road. Ashy, cherry, bright. This vineyard has been sold and perhaps Bjornson replaced it in 2010 going forward. Alas, no samples of Bjornson. The 2010s are too new to try, but Erin is excited as is every winemaker I've talked to. 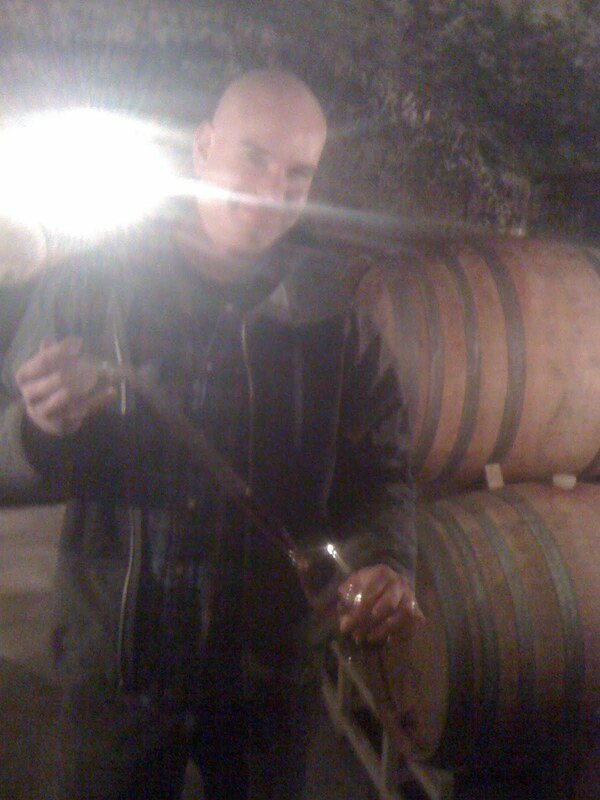 Here we see him with wine thief in hand, bathed in backlight and the fuzz of a crap iPhone camera. If you can see his smile, that's Erin. A big smile, and if I were the new owner of Evesham Wood with wines in cask like we just sampled, I would be smiling big too. A postscript on the transition at Evesham Wood. Erin detailed what we've heard more generally elsewhere. Russ and Mary weren't looking to sell the winery as much as find the right place to hand it down. Apparently they offered it to Erin a while back but it took him a while to say yes. There's a weight to taking on what Russ and Mary built, and just as they wouldn't give it to anyone, Erin's smart enough to know he should make sure he felt up to it. Needless to say, he does, and he's very sensitive to not wanting much change in the approach. I thought pricing might go up, but no, there will be no increases beyond anything ordinary. There will be a bin dumper and already I saw two new presses. But the "Box" fork lift is staying. The farming. 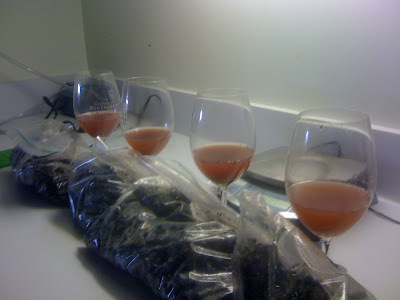 The winemaking approach, pretty much everything. Without saying any specifically, Erin mentioned that he and Russ don't agree on everything, which stands to reason. But that only underscores how much they do agree. 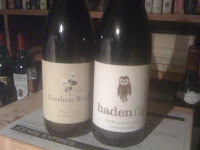 Haden Fig, Erin's other label, will continue and provide more ground for experimentation. So Evesham Wood fans should be very excited for the future. I know I am. We bid goodbyes with talk of comparing Bjornson barrels in the spring. That should be good. You may recall my post from July about nocino, the green walnut liqueur made in southern France and Italy and, more and more it seems, Portland, Oregon. 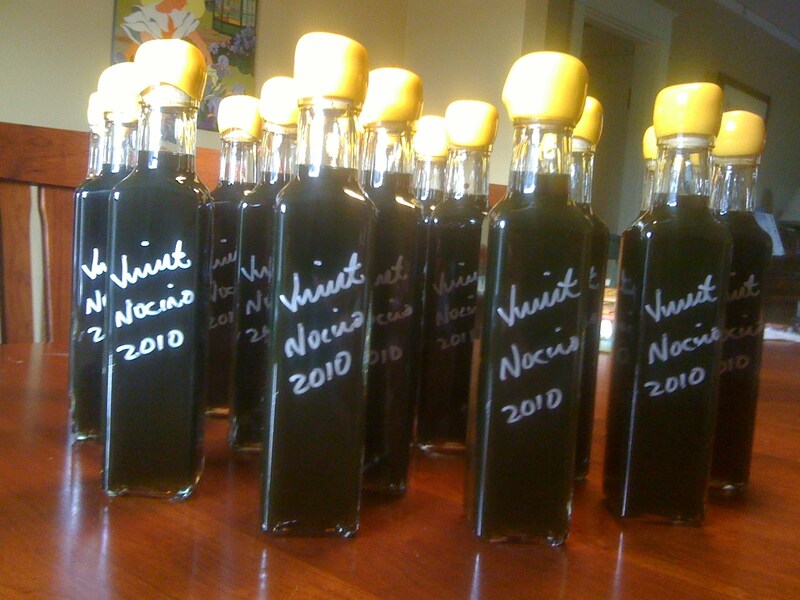 It all started with my friend and Guild Winemakers co-conspirator Anne Hubatch and family holding their annual nocino party on the last weekend in June. That's traditional nocino-making time, when walnuts are sizeable but still immature, the way you want them for nocino. The Hubatch party had been featured prominently in Mix magazine in 2009, complete with instructions on making your own nocino. We were invited to this year's party but because of the crazy cold and wet spring, the walnuts weren't ready for nocino until mid-July. 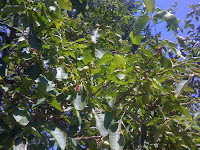 By then, I'd gotten my neighbor Edward's permission to harvest lots of walnuts f rom his front yard tree. 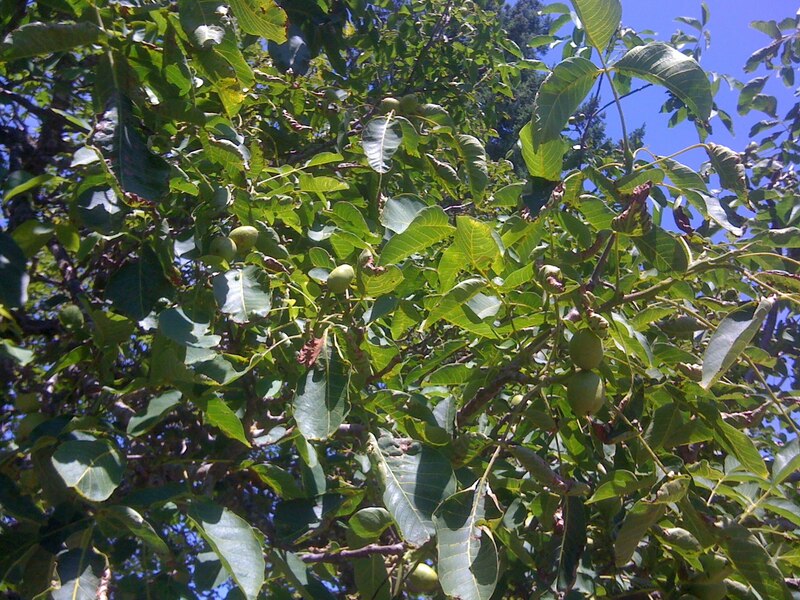 So with a ladder and tree trimmer turned walnut harvester, I drew the attention of the kids on the block in my quest for perfectly underripe walnuts. With lots of help, I gathers several dozen and took them home to make nocino. After quartering the walnuts, I simply put them into two jugs and poured in white wine, vodka, everclear, cloves, cinnamon sticks, fresh orange peel and varying amounts of sugar as a test. The jugs were intentionally not filled all the way, then left out in the light, heat and cold to oxidize as much as possible over four months. It's November and ti me to strain what's become a brackish liquid and check on progress of flavor and aroma development. I'd periodically open and close the tops of the jugs to give a sniff and to get more air in contact with the liquid, to help tame the fierce tannin from the walnuts. Thing really unripe bananas, and think of the oxidizing process as a slow cooking that helps sweeten and cure things until they are delicious. At least that's the idea. Along the way, things smelled great but quick tastes showed lots of raw tannin. I hoped time would help calm that down. 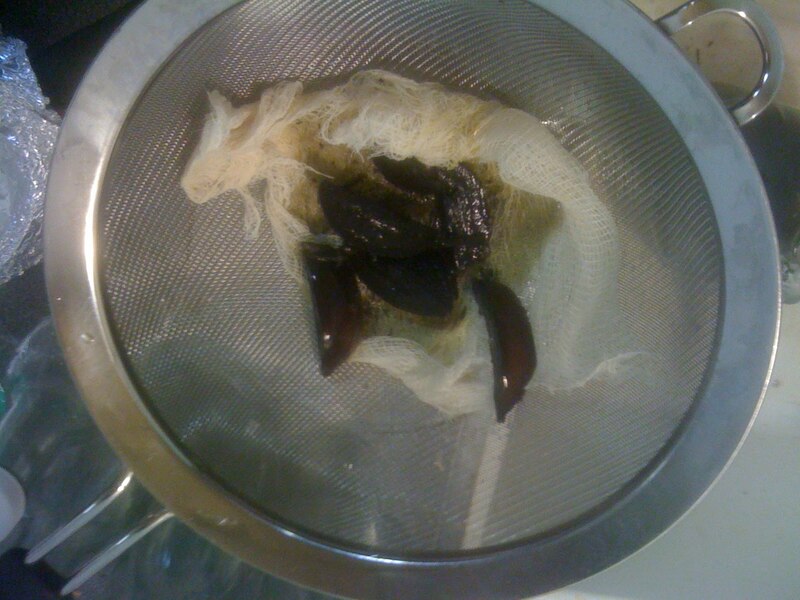 Now, I strained the nocino first through a fine mesh strainer and then again through the strainer lined with cheese cloth. I did a good job catching bits of sediment and the occasional wedge of blackened walnut, which you can see here. 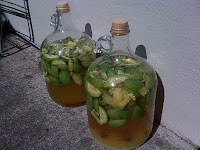 The fragrance of the nocino filled the garage where I was working and I couldn't wait to taste the nearly final product. First I tried the half sugar jug, pouring a bit into a dessert wine glass and holding it outside to get a good look at the color in natural light. This sample was fairly bitter and tannic, definitely in need of either more time, more sugar, or most likely both. Then I tried the full sugar jug and it was much fuller and smoother, if a touch too sweet. I found it interesting that the full sugar batch on the right, which started out lighter presumably because there was less air in the jug (more full because of more sugar), now it's darker. Seems like the sugar caramelized to a browner color while the lower sugar jug on the left maintained more of a honey color, with some browning in the middle but noticeably less than the other. I originally thought I'd end up bottling the two batches separately, but I found that a mix of the two samples was best of all. Now I'm thinking I'll blend them, but for now I kept things separate. Here are the two jugs of stained nocino in the middle, bracketed by the original jugs with stains on each showing the original fill levels., before I shook out the walnuts (which didn't take more than a minute for each jug). 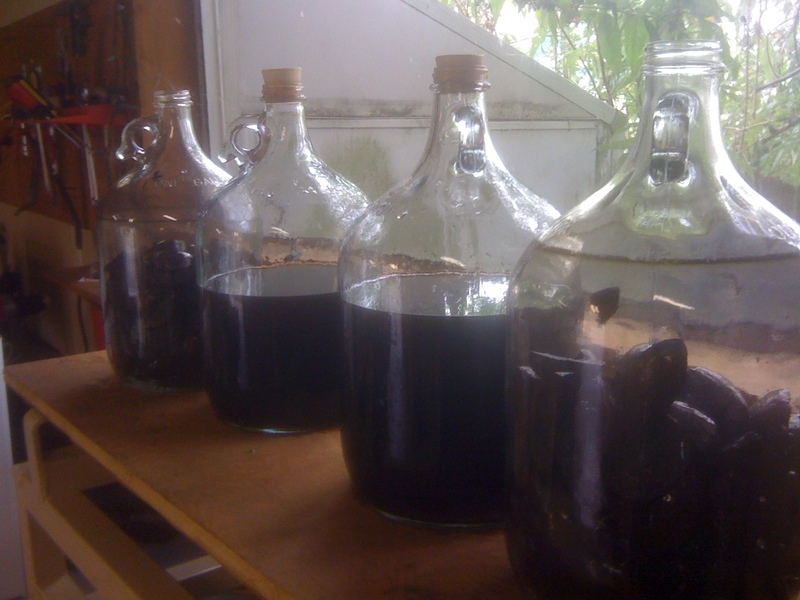 I'll let the strained nocino sit for a few more weeks to settle out more sediment, then perhaps strain again and pour into little bottles for keeping and giving. Neighbor Edward will get some, as will the Hubatch family. I'm definitely saving some for the future. 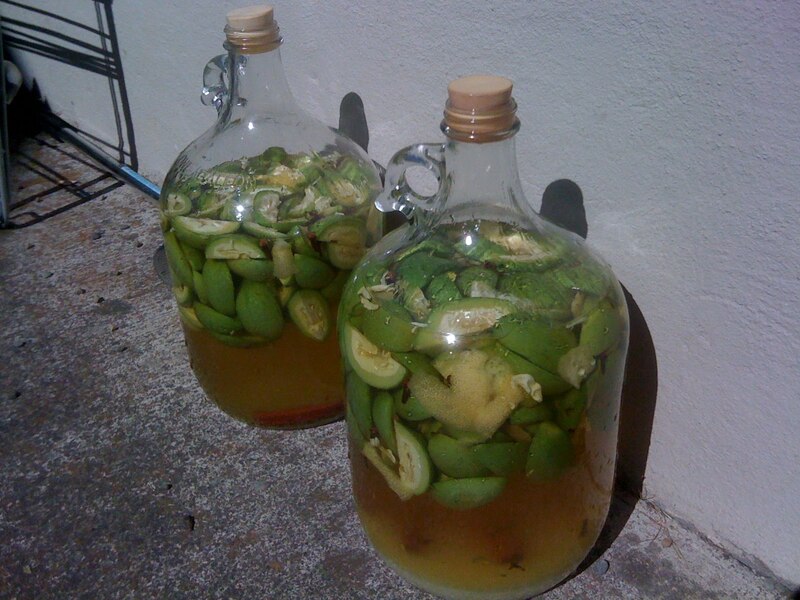 I've seen that nocino can improve dramatically for a few years. But I'm sure a few other bottles will find their way into other hands. Nothing like nocino for the holidays. We left off at pumping the freshly crushed grape juice over the grapes skins, to aerate the "must" (what you call the unfermented, crushed grapes) and gently begin extracting color and aroma from the skins into the juice. Then our technique is to let the fermenters sit for days on end until fermentation starts naturally. Temperatures and sugar levels are checked daily, and things monitored to make sure no issues arise. 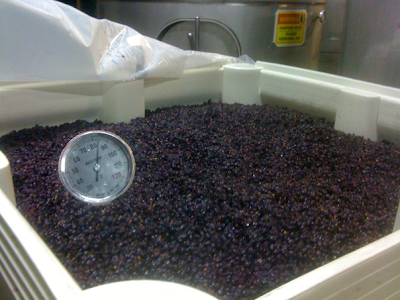 Once the grapes have naturally come up in temperature by the beginning of fermentation, this year about a week later, we punch down the cap of grape skins that rises up in the bin (think bread dough rising). Once fermentation is going in earnest, the cap rises nearly to the top of the fermenter and things warm up significantly. This year temperatures rise to the low 90sF. Here you can see the thermometer reading about 84F. The view from above a bin, the punchdown tool in the fermenting must and the telltale visual of fermentation, foam, rising through the hole made in the cap. The cap of grape skins can be a foot thick or more in these 1.5 ton fermenters, and they are tough to punch through at the peak of fermentation. As things wind down, the cap softens and things are easier to mix. Here's Armstrong grower Doug Ackerman lending a hand with the punchdown tool. 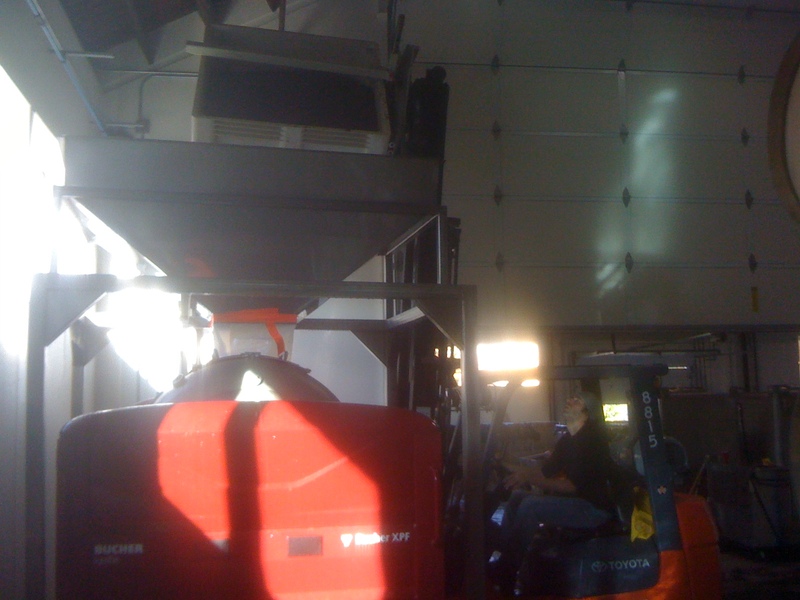 Things are more than busy in any winery at harvest time. 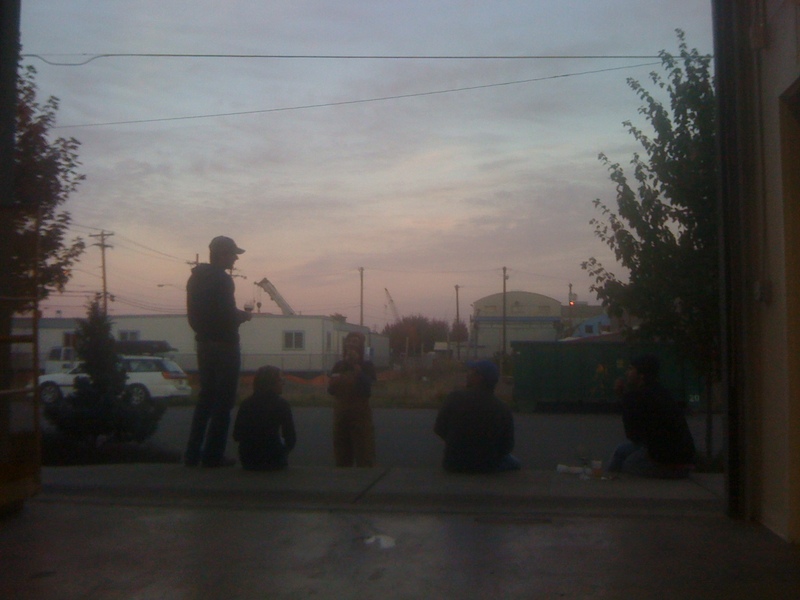 Still, there are moments of reflection, especially on a beautiful evening when you know you'll be working late. And things frequently go late. Bin after bin of grapes to be sorted. Then everything to clean up, only to get dirty again the next day. Mornings are the time to check the fermenters, using a strainer to get new wine to test for sugar level, temperature and acidity. And senory evaluation, meaning smelling, tasting and of course spitting, to see how much tannin is in the wine, among other things to watch for. Here's a beautiful shot of pinot blanc destined for another label fermenting, the bubbles of carbon dioxide sparkling like stars. Stars that smell like guava. Space like that would be nice, no? When fermentation is done, it's time to drain fermenters. 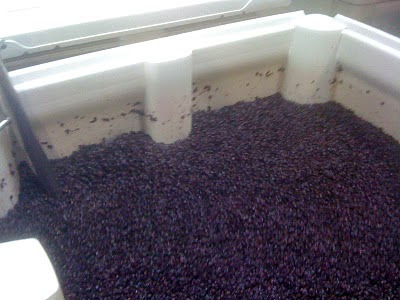 Here is one of the Armstrong bins three weeks after picking and processing. Using a sieve, the new wine is pumped into another bin to settle for a few days, the grape skins scooped out to smaller bins that can be dumped into the press. 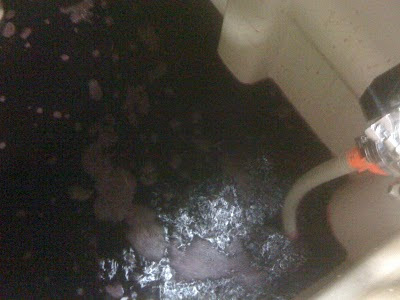 Here's that wine being pumped into the settling bin. 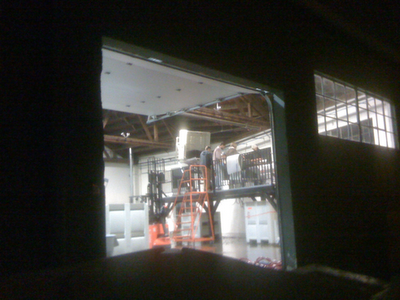 Here are the grape skins dumped by forklift into the press. 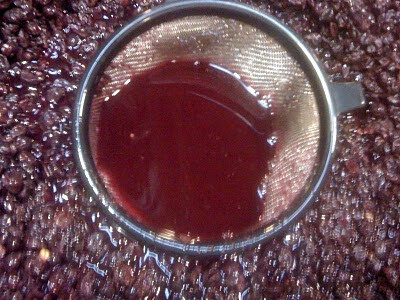 About 80% of red wine from a fermenter is "free run," meaning it is liquid you can draw off the skins without any work. The other 20% is "press wine" that comes from squeezing the skins. Here's the press pan full of press wine, much cloudier than the free run wine for all the solids pressed out along with the wine. After a few days of settling, the final task is putting the new wine in barrels. Once everything is in barrel, harvest is essentially done. 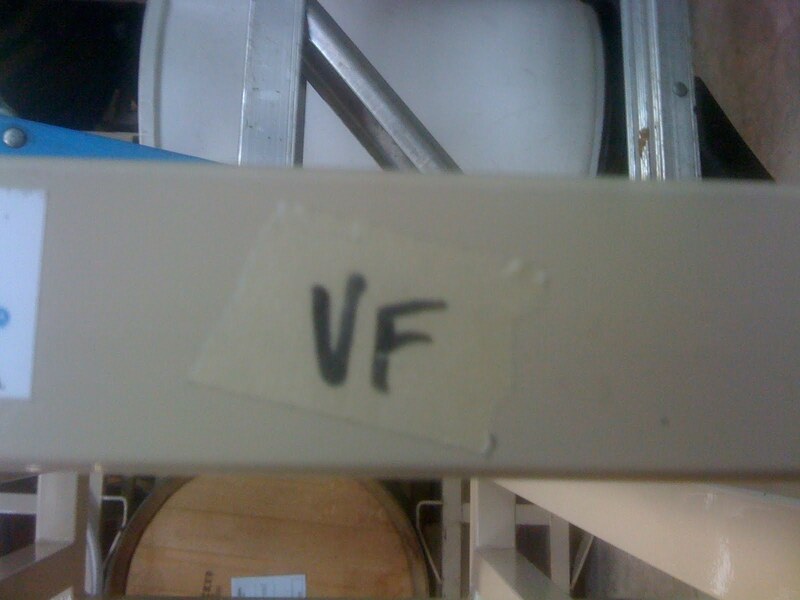 Here's a tag on one of the iron barrel racks that needed some repainting to protect against rust before barrel filling. 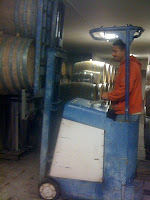 The barrels get cleaned and filled with wine, stacked by fork lift and stored for a year or more of ageing. Harvest is now done, and never a moment too soon. It's November and time to begin looking forward to the coming year. 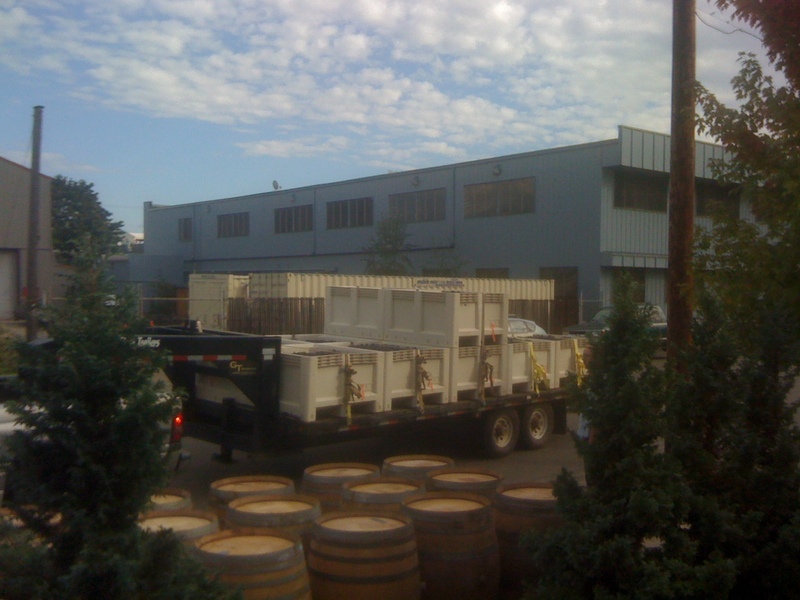 We're back after a busy month bringing in grapes and making new wine. Rather than detail the events just in words, let's try a more image-based approach, starting back in the middle of the growing season. 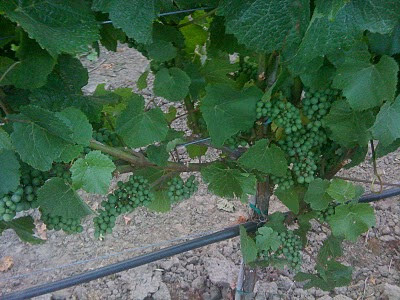 Here were are in late July at Armstrong vineyard on Ribbon Ridge, well past flowering so that the grape vines have set their crop but well before veraison where the grapes turn color and begin to ripen. All looks good, as we'll see, things continue to go well despite strange spring, summer and fall weather that makes even jaded Oregonians think twice. Cold and wet in spring. Mild in the summer. Ultimately perfect in the fall. Speaking of perfect, here's my bride at Armstrong on that gorgeous late July night, walking in the paddock with our daughter, chasing neighbor horses. Life is good on Ribbon Ridge. 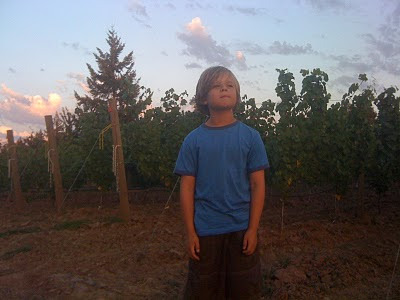 Our son Martin in the vines this same night. Looks like a future Oregonian vineyard hand and cellar worker if you ask me, not that I'm pushing the kid too hard. 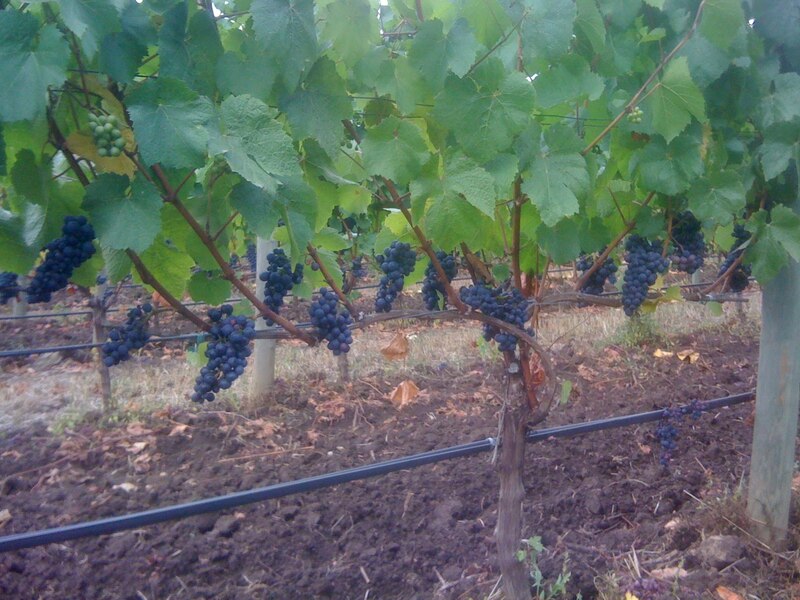 Meanwhile, down at Zenith Vineyard the Pommard clone Pinot Noir in Block 6G is looking good in mid-September. Leaves completely pulled to promote good airflow with our cool and occasionally downright humid late summer conditions. Veraison has come and gone but harvest is still weeks away yet. Up at Armstrong, the grapes are looking better and better. You can even see a little dehydration, not something we look for but something that indicates the exceptional ripeness this vineyard achieved in what was a challenging year in many sites. 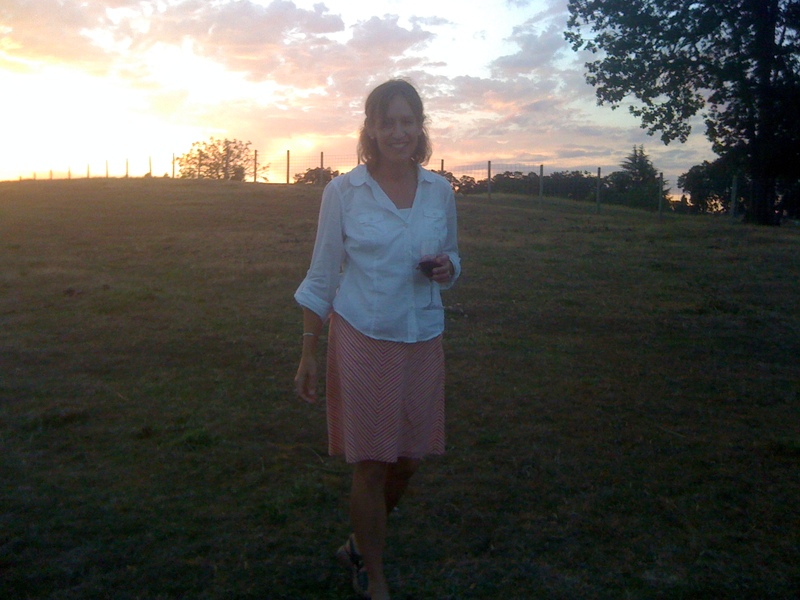 Daughter Dolores in the vines at Armstrong, late summer. We are on a vineyard walk talking about ripeness, what it looks, feels and tastes like. She is pretty interested. One of the highlights of my summer for sure. Yours truly, in a rare appearance on these pages. Enough. Early October now at Zenith. Lower leaves starting to yellow, fruit more than completely exposed but looking fabulous. Tim Ramey and company at Zenith do an incredible job. That same day, up at Armstrong where leaves in the 667 block are also starting to turn. I pull cluster samples at both sites to see for myself how things measure out and taste. Back at the winery, those samples provide the first look at 2010. Juice coloring up pretty quickly, definitely a sign of ripeness. Flavors sweet with strong acidity. 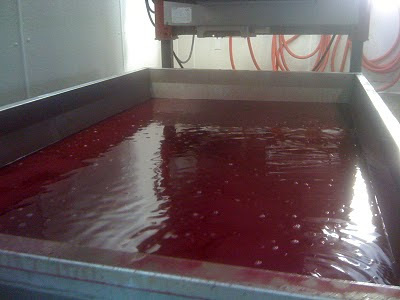 Sugars higher than expected and the call is to pick two days later at Armstrong, the following week at Zenith. 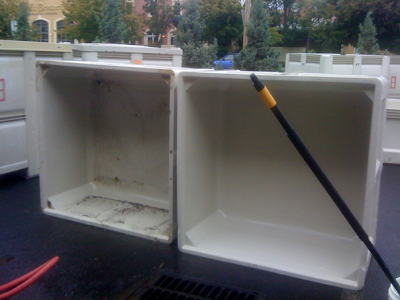 That means it's time to wash picking bins. Harvest is on. 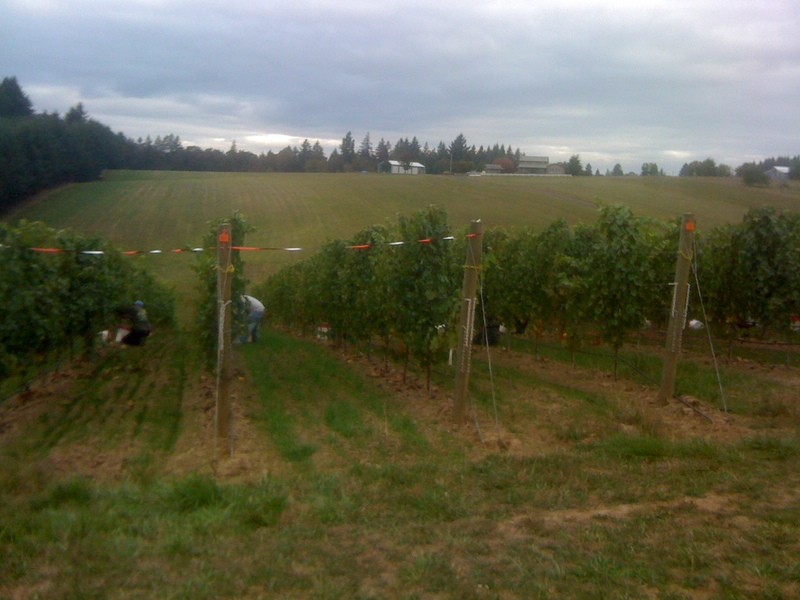 Friday morning, October 8 at Armstrong vineyard for the first harvest off this site planted in 2007. The crew works fast and clears all 12+ acres in half a day. Amazing work. The sun comes out after the clouds burn off, and the grapes arrive at the winery. Now the real work for us lazy cellar people begins. Meanwhile the pickers are undoubtedly drinking beer. Well earned. Jennifer on the sorting line, smiling because this is just the beginning. And because this is great looking fruit. After several hours of sorting through each cluster, it's not so fun. But she even looks great then too. The final shot of part one - a pump over of the newly crushed grapes to mix them well before they sit until fermentation begins naturally. That means no punching or pumping for a week or more. 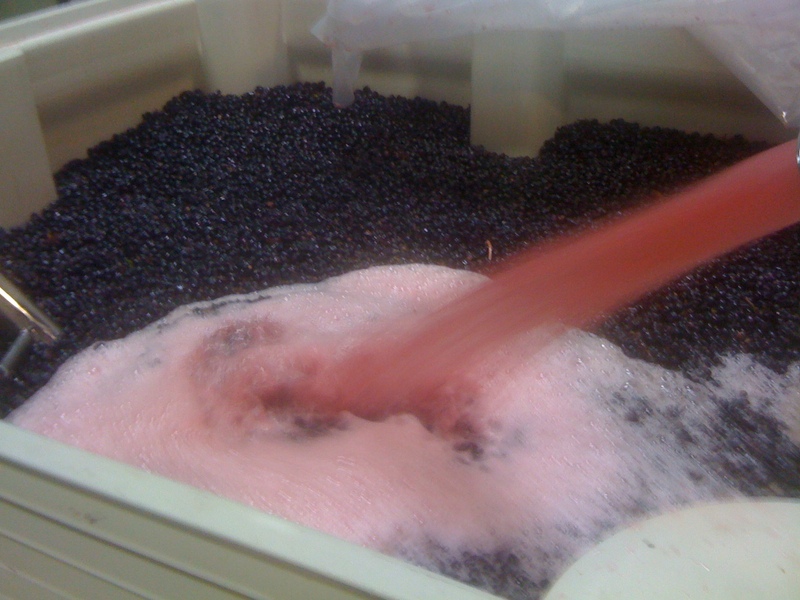 Nothing until things get going really well, then twice daily punchdowns to mix things well and aerate the fermenting grapes. We'll see next time how things proceed.